Situational awareness: Hurricane Michael — now a category 4 storm — has prompted oil-and-gas companies to evacuate 75 Gulf of Mexico production platforms, according to the Interior Department. Almost 40% of Gulf oil production and 28% of its gas production has been paused. The Financial Times has more. President Trump expressed suspicion regarding the United Nations' new, landmark climate change report, saying that he'll look at the study but also wants to look at "which group drew it," Axios' Michael Sykes and Andrew Freedman report. It was the president’s first acknowledgement of the widely covered report by the UN's Intergovernmental Panel on Climate Change. The intrigue: Yet, as their piece notes, representatives of global governments approved each word of the new report’s summary, including officials from the State Department. It was also co-authored by U.S. scientists — and the U.S. was one of the countries to request the new report when the Paris Agreement went into effect. My thought bubble: Trump's response underscores a wider dynamic — while the White House plans to abandon the Paris agreement and agencies like EPA and the Interior Department are scuttling Obama-era climate work, other parts of the federal government are continuing to be involved. Also, Trump's unfamiliarity with it shows how climate change simply isn't really on the White House radar screen. "It was given to me. It was given to me. ... And I want to look at who drew it. You know, which group drew it. Because I can give you reports that are fabulous, and I can give you reports that aren’t so good. But I will be looking at it." ICYMI: The report dives deep into the severe and deadly consequences the global community could face in just a few years if temperatures are allowed to move past 1.5°C, or 2.7°F, of warming relative to preindustrial levels. It also details preventive measures the world's governments can take. Bloomberg NEF has new data on the scope of financing for EV players in China, where the market is growing as government policy pushes more EVs into the world's largest auto market. By the numbers: The major takeaway from their wider quarterly report on clean energy finance trends — the 6 largest private equity or venture capital deals of 2018 so far have all financed Chinese EV firms, Bloomberg NEF said. That includes two big VC rounds during the third quarter, where Guangzhou Xiaopeng Motors Technology raised $585 million and Zhejiang Dianka Automobile received $294 million in funding. Beyond VC and private equity, another recent big financing move in the EV space is Chinese startup Nio raising $1 billion in its IPO on the New York Stock Exchange. The big picture: It's another sign of growing activity in the space. A recent International Energy Agency analysis looked at VC money flowing into transportation-related startups. Amy reports ... Emissions from manufacturing plants making essential materials like cement and steel are an overlooked problem in addressing climate change, according to a new report released today by centrist think tank Third Way, AFL-CIO and the Council on Competitiveness. If America’s top 5 manufacturing sectors were their own country, they’d rank 9th in the world in terms of energy used. 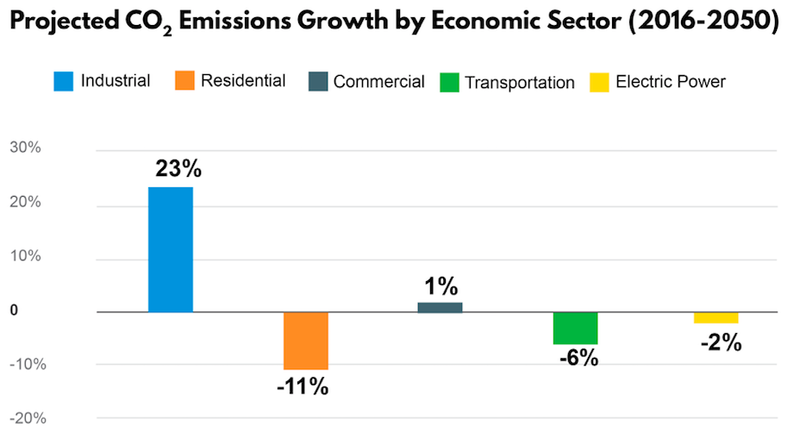 While U.S. industrial emissions are set to rise between 2017 and 2050, all other sectors — including transportation, electricity, commercial and residential — are set to decrease over that same time period. Use more energy-efficient technologies. This can range from using more efficient light bulbs to installing whole new ways of generating heat to power the chemical processes. Install technology that can capture carbon dioxide emissions from facilities. While this is technically feasible, it's not widely available for commercial use. Yes, but: Any changes to the manufacturing sector as it relates to its carbon footprint are unlikely to come about without action in Washington, which appears to be unlikely soon. EPA: Per Bloomberg, "EPA Acting Administrator Andrew Wheeler has used his private social media accounts to interact with incendiary content online, including 'liking' a racist image of former President Barack Obama and posts from conservative provocateurs." Ethanol: Via Politico, "President Donald Trump ordered the Environmental Protection Agency to expand sales of corn ethanol on Tuesday, delivering a gift to farm state Republicans a month before the midterm elections." Yes, but: Refiners are likely to sue the administration over the move, the Washington Examiner reports. Coal: The Wall Street Journal reports, "Westmoreland Coal Co. filed for bankruptcy protection Tuesday with an agreement to sell the mining business to a group of lenders, subject to better bids, in a transaction intended to reduce its $1.4 billion in debt." The company said in court papers that it's North America's sixth-largest coal miner, with 19 mines spanning six states and Canada, the WSJ reports. The big picture: "Westmoreland ... is the fourth major coal company to file for bankruptcy in the past three years, joining Peabody Energy Corp., Arch Coal and Alpha Natural Resources," per AP. Via the Energy Department, the number of vehicle per thousand people in China is rising fast and in 2016 was similar to the United States. That is, the U.S. in 1923. Why it matters: China is already the world's largest auto market and, as that factoid shows, there's room for massive growth. How much of that growth is met with EVs will play an important role in the future air quality and CO2 emissions of the world's most energy-hungry nation.